Whether you’re looking to cut costs, manage your rapidly growing business operations, improve your internal controls or simply looking for better ways to manage your business, Cordia Partners provides real-world strategies to help you navigate the challenges facing your business today and tomorrow. 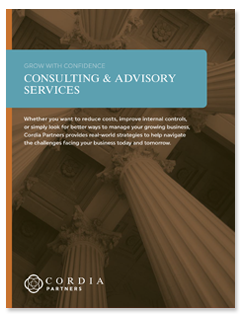 At Cordia, we can help you transform the way you do business in order to drive best practices, increase productivity, reduce costs and improve internal controls. First, we listen to your needs so that we fully understand the unique aspects of your organization. From there, we work with you and your team to align people, processes and technology with the company’s strategic vision and back office needs. Our finance department diagnostic assessment identifies opportunities for your finance organization to increase its effectiveness, efficiency, and to provide better support of the company’s operations. We evaluate your existing staffing structure and capabilities, processes, and the related technology environment and identify opportunities for improving your process efficiency and quality through process redesign and effective use of technology based on proven best practices employed by other similar organizations. Cordia professionals will work with you to implement solutions identified during our finance department diagnostic assessment that will standardize, simplify, and create efficient back-office operations. Beyond process improvement, Cordia focuses on future state operating models to ensure that the right back office resources, processes, and technology are deployed to support your current and future operational needs. Accurate financial statements are a minimum requirement for monitoring the results of operations, financial position and cash flows. But running your business based on financial statements alone means you may not have enough information about what has happened or why. More importantly, they can’t tell you where you’re going. A strong financial planning and analysis (FP&A) capability is critical for decision-making at all levels of your organization. If you are in the market for a new accounting system, our consultants can help you through the entire implementation process, including purchase, installation, design, implementation, data conversion, testing and training. We are recognized experts in products that support Government Contractors, Not-for-Profit organizations and Commercial services firms. Learn more about the Deltek products we support or to schedule a free demo, contact us today. Cordia’s consultants have been trained and certified through the Sage Intacct Value Added Reseller Program and are able to cost-effectively integrate, configure, and extend the system to the level of customization your business requires. Unanet offers a cloud-based Professional Services Automation (PSA) solution that is designed for project-based organizations. Cordia Partners is a Certified Solutions Partner Provider (SPP) that has been working with Unanet since they began their partner program. Our team of product experts is currently certified to implement and support the following Unanet products.